Everyone knows who Koko the gorilla that speaks sign language is. For her birthday one year, she signed to her teacher that she wanted a kitten. Koko’s teacher wasn’t surprised, as Koko’s two favorite books were about cats. 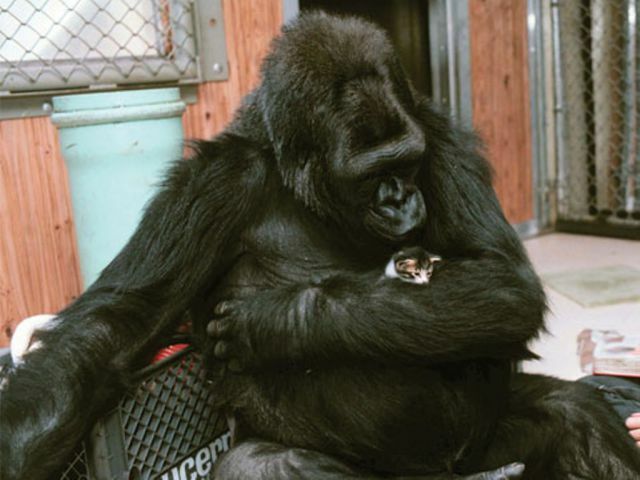 They adopted one from an abandoned litter and Koko showed it tender care and gentleness. Thanks to Don for sending me an email filled with wonderful pictures of unusual animal friends. Had to share this one. On this last day of March I hope your day, your month, and your winter goes out like a lamb, but also, hoping we can all learn from the gorilla and show tenderness and caring to all as we move through our day. Something light this VFT. Make it a great one. 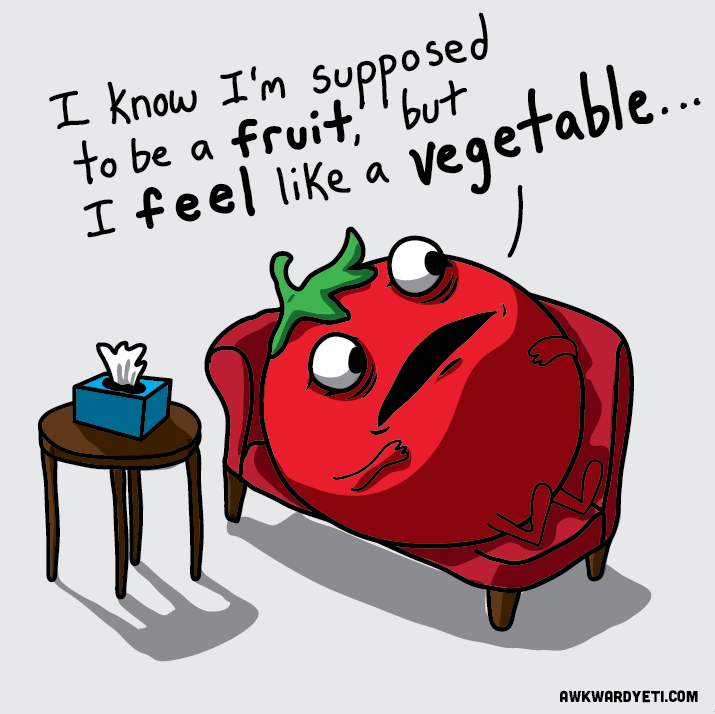 Remember, considering a plant-based meal or 2, today or any day. It will do a world of good for your own well-being as well as the well-being of our animal friends and our Mother Earth. Peace…. And a very special happy birthday to 2 of my favorite people in the whole world. Enjoy your day, Joy and Lesley. Many, many more. Posted on March 26, 2014 March 26, 2014 Categories Fitness, Holidays and celebrations, Motivation/Inspiration2 Comments on Here is Your Reminder! Biggest Losers….Where are They Now? We all wonder what happens to contestants after the show. Ali was the first female to win the title of Biggest Loser having gone from 234 to 122 pounds, and has since gained back 50 pounds. This breaks my heart, as the reality of maintaining weight loss is a tough one, especially when you lose all that weight in a controlled environment and then have to go back out into the real world. If only we could all commit to tuning in and taking care of our health, making wise food choices, getting our daily exercise and asking ourselves “What am I really hungry for?” perhaps we could all find a more peaceful balance in our lives. Perhaps. Posted on March 25, 2014 March 26, 2014 Categories Biggest Loser, health and happiness, weight loss3 Comments on Biggest Losers….Where are They Now? How to Make Your Own Aroma Diffuser. EASY! While we were away this weekend, I saw a great “recipe” for a simply DIY fragrance diffuser and I thought it was worth trying and sharing. Simply pour a thin oil like almond oil into a small bottle with a very narrow neck. I used an empty old diffuser bottle that still had the reeds in it. Add a few shakes of your favorite essential oil (I used lavender) and mix well with a reed before adding all the sticks back in. Once they are saturated, flip them over and flip weekly to keep the aroma fresh. You can purchase reeds in a craft store, but you can also use bamboo skewers or even chopsticks in a pinch. Cute idea as you turn your home from winter to spring! Thanks to Jeff for the DIY mosquito control garden idea! I will be building one, and also sharing that on here sometime this week. Looks pretty and if it will keep those darn mosquitos off us while sitting on the patio, that would be great! It was wonderful to see Kyle, Nicole, LeeAnn and Gary and the beach was beautiful. Derek and Jolene, sorry we missed your calls (on every phone!). Hope you had a great weekend celebrating JoAnn’s birthday! Let’s catch up today!!! Regular schedule this morning, so it’s time to get ready for the gym. I have had one quote stuck in my mind since I posted it last week because I LOVE IT. It is so simple, yet so huge and is certainly worth repeating. I am going to make it my mantra! What better way to kick off spring, than with spring break, which here in Broward County begins today, for public school students and teachers. Wishing all my teacher friends and all the students and their parents, a safe and fun-filled vacation. Thanks to Erica and Jeff for coming by last night with all those beautiful herbs. The basil smells so good, but all the greens and herbs do! Thanks for thinking of us! It was nice to sub for Ellen and catch up with her students, yesterday. I’ll be doing the same today at 10, as well as my own sessions. Remember, no class tomorrow morning. I suggest if you ordinarily take Saturday morning class, you consider getting outside for an hour and walking, jogging, mixing it up and taking advantage of the great outdoors. The gym is our temple, but sometimes we have to go with the flow and change things up. I will be celebrating the arrival of spring in all I do today. 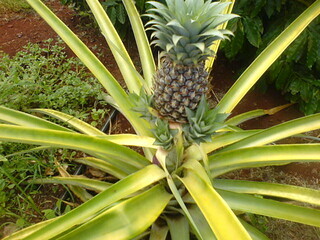 It is apparent in the pineapples growing in our yard, the mango flowers that are quickly turning to fruits and the quickly rising temperatures. In spring, all things are new and all things are possible. **I will be subbing for Ellen at 10 this morning and also at 10 tomorrow morning (followed by my regularly scheduled 11:30 class, tomorrow) This Saturday morning there will be NO 9:30 class.